Cook County commissioner Larry Suffredin addresses attendees’ questions at a forum Wednesday night. Community activist Betty Ester argued against the proposed dissolution of Evanston Township, a referendum Suffredin supports. A number of residents voiced concerns Wednesday night at a forum on the proposed dissolution of Evanston Township, a referendum to be voted on March 18. The township is an organization made up of trustees, who also serve as City Council aldermen. The township shares the same boundaries as the city and works for general and emergency assistance for citizens, among other objectives. This March, Evanston voters will have the chance to decide on a mandatory referendum asking whether or not to dissolve the township. 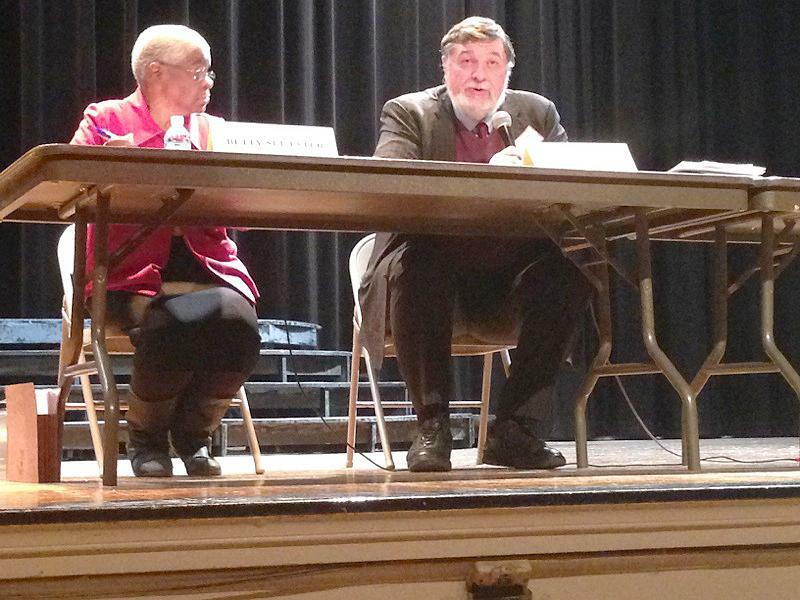 The forum, hosted by the Central Street Neighbors Association at Haven Middle School, offered attendees two sides of the argument concerning the proposed township dissolution. Cook County commissioner Larry Suffredin spoke in support of abolishing of the township while community activist Betty Ester spoke against the proposed dissolution. “Our township has done a terrible job in reaching out and getting people who need assistance the help that they should have,” Suffredin said. Ester told The Daily dissolving the township would mean more money from taxpayers. She said the township has a maximum amount of money it can spend but City Council does not have a cap, allowing Council to draw more money from taxpayer revenue. “There’s not a cap. Right now, there’s a 5 percent cap on the township, so they cannot tax no more than 5 percent,” Ester said. A number of Evanston residents voiced their concerns about the referendum as well. Kevin Johnson, 26, spoke at the forum and told The Daily it is important to distinguish between a community, like Evanston, and just a neighborhood. He said he didn’t want Evanston to become “a ghost town like Chicago” and that it’s important to focus on job creation and not voting for the dissolution of the Evanston Township. Another Evanston resident, Albert Gibbs, asked Suffredin to explain why residents should believe that the government is going to work for the needs of everyone, especially low-income citizens. Gibbs spoke against dissolving the township and said he did not feel that the diversity Evanston says it stands behind is accurate. Black residents, he said, were still being discriminated against, which he says ties in to the dissolution. He said those with money did not want to help those without. Only one attendee publicly stated his support for dissolving the township. He addressed Ester, asking her to cite the reasons why the township should not be abolished when things weren’t going to change. He made reference to his personal experience having made use of other assistance services outside the township, which he found more helpful.